Kim & Jason: You wear Missmatched socks, feature kewpie dolls on book covers, write about purple cows, and created a book that was packaged in a cereal box. You obviously have a pretty strong childlike spirit. Where does that come from, and why do you feel it’s important in the work you do? Seth: I actually think that most kids aren’t so childlike. With all the pressure and fear and insecurity they deal with every day, it’s hard for even them to be that way. What I’m shooting for is fearlessness and joy, combined with an understanding of why it’s all worth it. Where does it come from? I think it comes from realizing that the riskiest thing I can do is play it safe. K&J: You’ve often pointed out that in our competitive landscape, the little things sometimes make the biggest difference. What are some little things that a business can do (maybe something that most don’t), which would make a big difference to their bottom line? Seth: There are a million. They could involve treating people with respect, as opposed to hiding behind a company. They certainly involve failing, and failing often, in an attempt to do something worth doing. K&J: Many businesses these days are suffering from a bad case of Adultitis. They are stuck in unimaginative ruts, afraid of change, and take themselves way too seriously…is there any hope for them? What can they do to change? Seth: Well, of course, Adultitis means “swelling of the adult”. What’s swollen, apparently, is the insulating bubble we set up around ourselves. My advice is to strip that away, discover what happens when people laugh at you. It’s not so bad. K&J: What are the biggest areas you see Adultitis negatively affecting business these days? Seth: I hate the way big companies hide behind double speak and ‘policies’ and I hate the fear people in organizations have of their bosses. K&J: For kids, the best thing about Cracker Jacks and cereal boxes are the free prizes that come inside. Can you explain your definition of a free prize in the context of business and why it is importent? K&J: Kids love stories. Heck, everybody loves stories. You have said that companies need to be good at telling stories. Why is telling a good story so important these days? Seth: There’s no time. There’s too much clutter. What we want are human interactions and transparency. We want to connect with other people. Stories do that. K&J: We believe that one of the reasons for your success is your ability to stay curious and see the world through “new eyes,” not unlike a child. What is your secret? Seth: A long time ago, I decided I didn’t like the status quo. I get joy out of challenging it and watching it change. When I get stuck, I try to reconnect to that. K&J: When you were a kid, what did you want to be when you grew up? Seth: Believe it or not: This. This is what I dreamed of. I thought I’d be running a summer camp, but I sort of do that now, just without the canoes. K&J: What is your big dream right now? 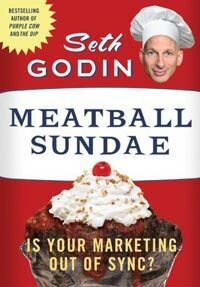 Seth: My big dream is that the fundamentalists of every stripe get rational and the rationalists get a little silly. Seth: Setting up a life you don’t need to escape sounds good to me.